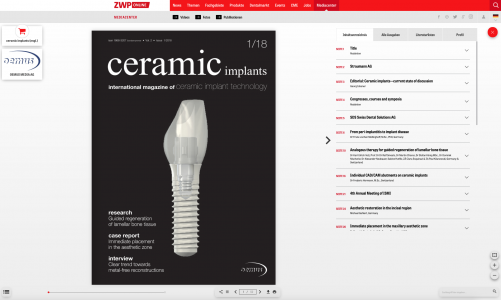 The new issue of ceramic implants – international magazine of ceramic implant technology – now available in print and as epaper – will keep you up to date with the newest developments in this promising field of implantology. The main focus of this issue is directed towards the two current, main topics of discussion which are on one hand the material and its processing characteristics and on the other hand the choice between one-pieced or two-pieced systems. 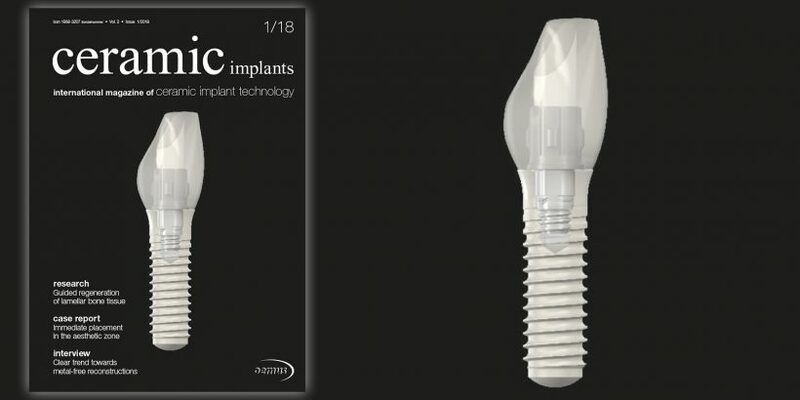 Detailed case reports and application examples will provide you with new ideas and solutions on what all is possible – enabling you to treat your patient even better. Discover the newest product developments in the section Manufacturer News and get an impression of the specialists’ points of view in our expert interviews. Research reports and details on the current state of discussion as well as upcoming events will give you further insight into this interesting market and the possibilities it offers.